Don’t miss the 10th Annual Downtown Shopping Party! Please respect my copyright. If you wish to reprint or reproduce any of the work on this blog, please contact me by e-mail, Christine (at) CaptionsCommunications.ca All photographs copyright Jim Peets. All rights reserved. Out in the Miami Sunshine! “The sun is out! Oh, this is what I was hoping for today,” came the delighted comment from the next room. We’d had two days of rain so we were more than happy to finally see the sun! My friend, and fellow author/blogger, Doreen Pendgracs and I were sharing a beautiful two-bedroom suite at the Metropole one of the South Beach Group of hotels in Miami. It was lovely, but we couldn’t wait to get out into the sunshine. After a quick breakfast we were off to the beach—just a few minutes away. 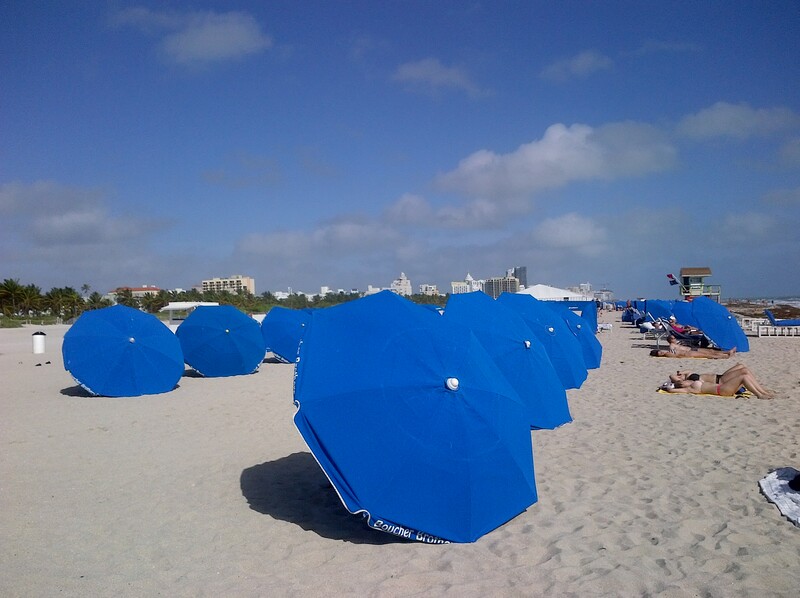 It was great to see so many folks also out enjoying the Miami sunshine, even if many were covering up under these bright umbrellas. The winds were high, and the waves were higher, so there were posted flags indicating that going into the water wouldn’t be safe. Flags or no, we had to at least wade into the ocean a little. 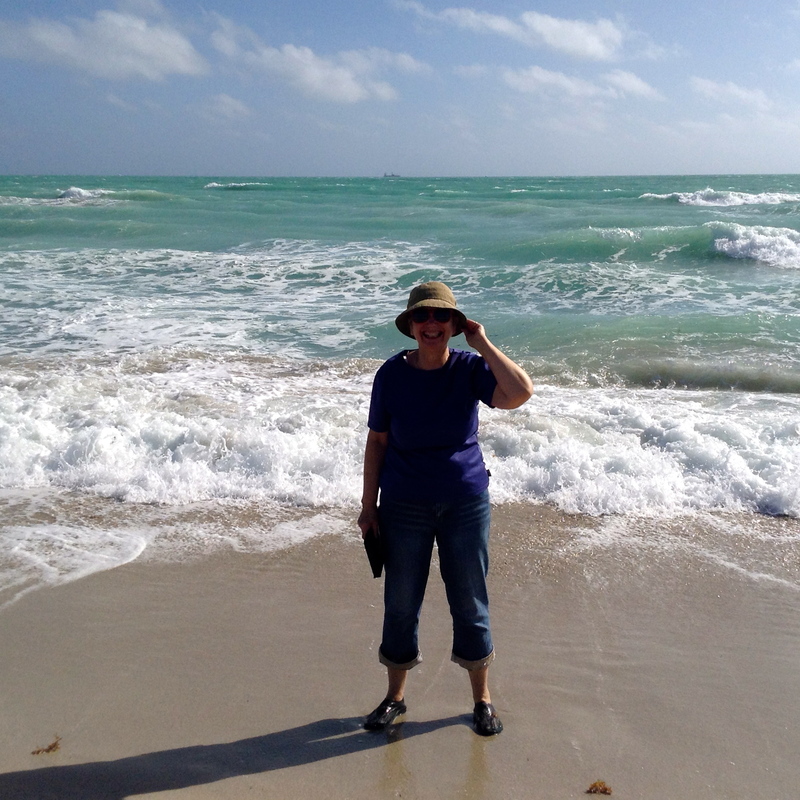 Our feet got wet when the waves rolled in–but that was just fine! For these two Canadian women escaping the cold and snow in November, this was bliss! Doreen was definitely giving the “thumbs up” to the warm, sunny day. After a leisurely stroll on the beach, we headed up the street to soak in more South Beach colour–and more sun. 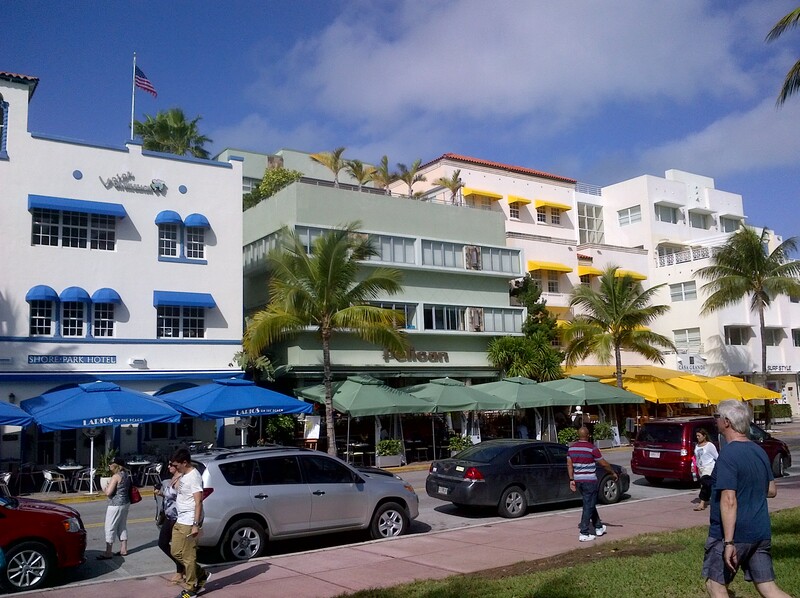 Ocean Drive is awash with these primary colours showing off the condos, boutiques and restaurants. Then it was back to the hotel for a quick change of clothes and off to Bayside where we were looking forward to a patio lunch and boat cruise. 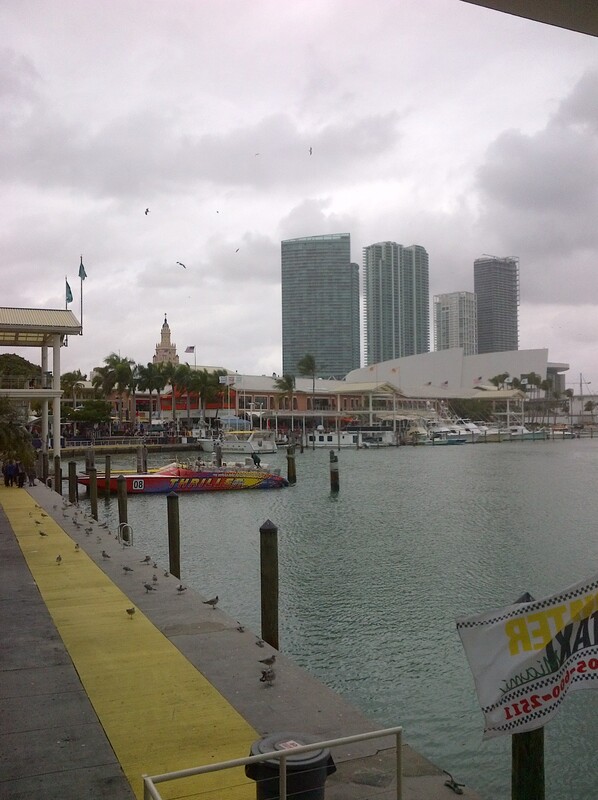 Since we’d made our way there twice for the bus tours, we felt quite confident in our commuting and found the right bus to get us to the “other side.” Within the hour, we were strolling by the marina at Bayfront Park. 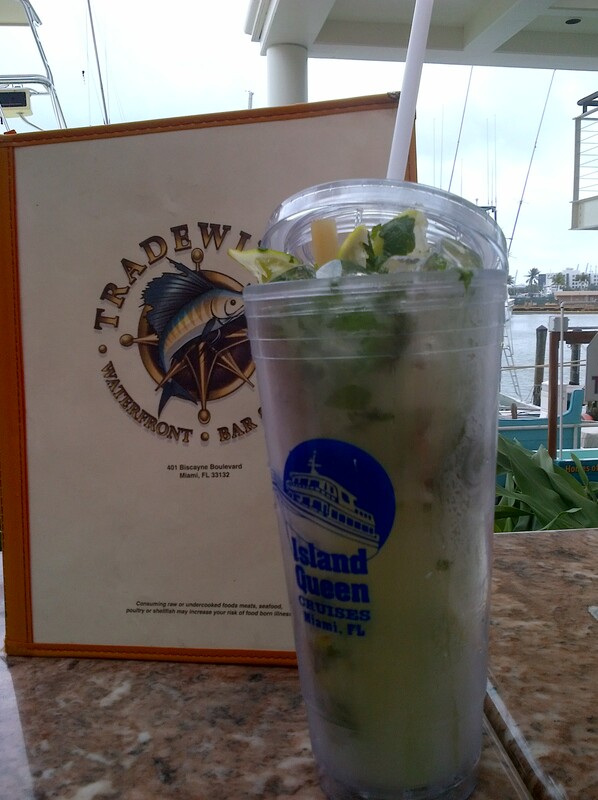 We checked out a few of the restaurants and decided to have lunch at the Tradewinds Waterfront Bar & Grill where we enjoyed Mojitos and kept the souvenir glass. I was pleased they could do a nice non-alcoholic version of this popular drink. I think I got extra ice and limes as the lid wouldn’t even fit. Oh—lunch was good too. Seafood—of course! (No photo—it wasn’t that special.) We didn’t know until the drinks arrived that the Tradewinds is partnered with the Island Queen Cruise line. Smart marketing! The cruise was next on our agenda, and thanks to Jennifer at the Greater Miami Convention and Visitors Bureau, we had free passes. We had a bit of time before we sailed so we perused the shops and watched some lively salsa dancing in the square. They were moving too fast and there was too big of a crowd watching the show for me to get good photos, so I just enjoyed all of the dancing–the pros and the amateurs from the crowd who’d joined in. The cruise line operates boats of several sizes, and we were on one of the smaller ones, which meant we both got window seats, and the boat had a more intimate feel to it. Our captain was a delightful tour guide. 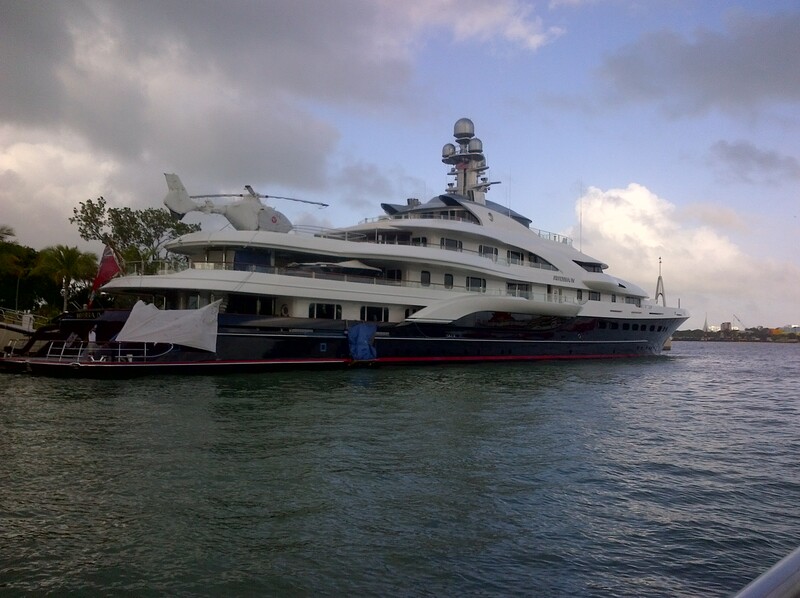 In my last post, Round and around on the Big Bus Tours I shared this photo of this “quarter-billion dollar” yacht. Owner Dennis Washington doesn’t like to talk about how much he paid for the yacht, or how much he spent renovating it. He says that what’s important is the joy it brings others in his life. Classy. I could handle some of this joy. 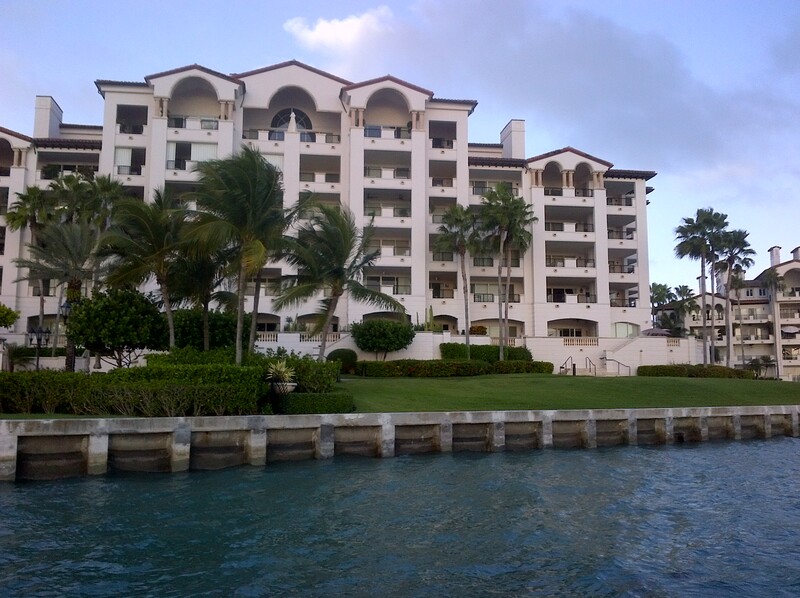 We also saw how “rich folks” can enjoy seclusion on Fisher Island. Apparently Tom Cruise and Oprah Winfrey have (or had) condos here. I guess they can afford the $270,00/year rent! Our captain told us that if boats get too close to the island, the skipper could be arrested, so to avoid that, he wasn’t going too close. It made for an amusing story—and who knows?– maybe it’s true. We just enjoyed the scenery. All too soon, it was time to head back to port, just as the clouds were starting to roll in. 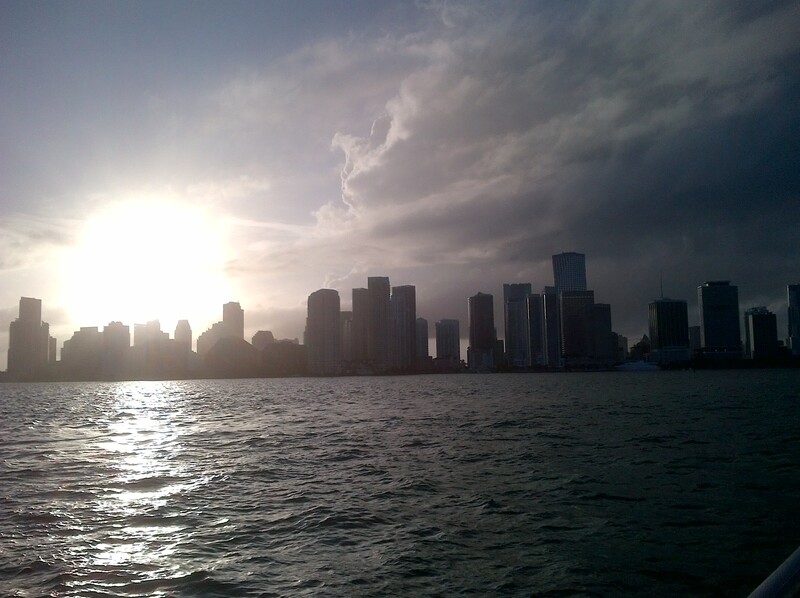 Having seen the tall skyscrapers from the buses, we enjoyed seeing the Miami skyline from the water– and the start of a beautiful sunset. Our day out in the Miami sunshine was coming to an end, and we’d thoroughly enjoyed every minute! 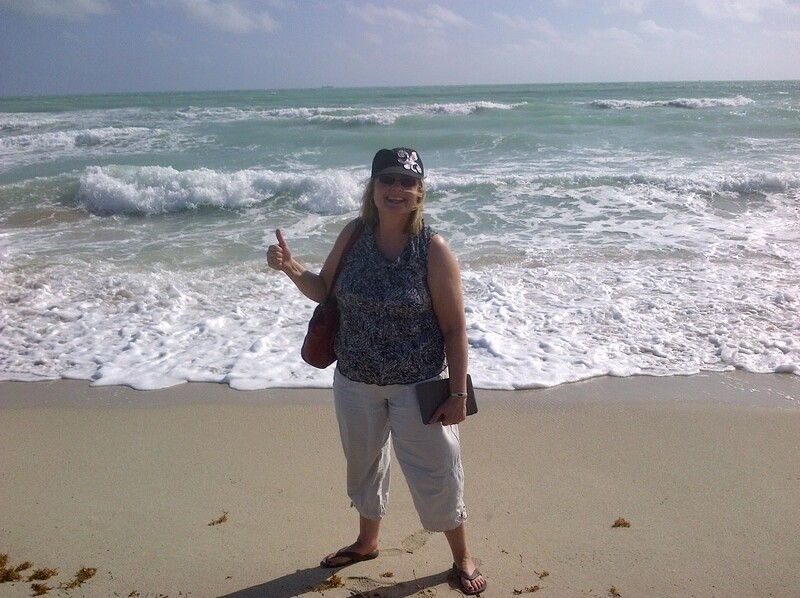 For more stories and great pictures from our Miami trip, please read Doreen’s posts on her travel blog, Diversions with Doreen. I can’t believe how much fun you packed into a short stay. Well done. We’ve marvelled at that ourselves, Lillie. We did pack a lot into the short stay and yet at no time did we feel rushed–or at least I didn’t. So it was a busy, relaxing time. LOVED this post, Christine. It reminded me of the fun we had in Miami. How I wish we’d had more time, but we definitely fit a lot into the short time we had in that amazing city. Thx for sharing it all with me. Thanks, Doreen. Yes, Miami is an amazing city, and it was so much exploring it with you. We really did pack a lot into those few days. Sounds like you had a great time. I enjoyed living it with you through your story. Yes, Suzanne, we did have a great time. You’ve travelled with Doreen, so you know how much fun it is being with her. I’d definitely go on another adventure with her. I’m glad we are able to share these memories through our blogs. Thanks for those kind words, Judy. Writing: yes. Photography: no, but I think I’m getting better. Doreen has much better photos on her site. It’s fun writing about places I visit, so yes, that will be one niche for me.